Ali bin Hussein, GBE (Arabic: علي بن الحسين بن علي الهاشمي‎, ‘Alī ibn al-Ḥusayn ibn ‘Alī al-Hāshimī; 1879–1935) was King of Hejaz and Grand Sharif of Mecca from October 1924 until he was deposed by Ibn Saud in December 1925. He was the eldest son of Hussein bin Ali, the first modern King of Hejaz, and a scion of the Hashemite family. With the passing of the kingship from his father he also became the heir to the title of Caliph, but he did not adopt the khalifal office and style. The eldest son of Hussein, Ali bin Hussein was born in Mecca and was educated at Ghalata Serai College (Galatasaray High School) in Istanbul (Constantinople). His father was appointed Grand Sharif of Mecca by the Ottoman Empire in 1908. However, his relationship with the Young Turks in control of the Empire increasingly became strained, and, in 1916, he became one of the leaders of the Arab Revolt against Turkish rule. Following the Revolt's success, Hussein made himself the first King of Hejaz with British support. While Hussein's sons Abdullah and Faisal were made kings of Jordan and Iraq, respectively, Ali remained the heir to his father's lands in Arabia. In December of the following year, Saudi forces finally overran Hejaz, which they eventually incorporated into the Kingdom of Saudi Arabia. Ali and his family fled to Iraq. Ali bin Hussein died in Baghdad, Iraq, in 1935. He had four daughters and one son, 'Abd al-Ilah, who went on to become the Regent of the Kingdom of Iraq during the minority of King Faisal II. Princess Khadija Abdiya – born 1907 – died 14 July 1958. Princess Aliya – born 1911 – died 21 December 1950, married her first cousin, Ghazi I King of Iraq, becoming Queen Aliya of Iraq. 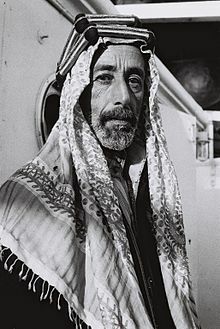 Crown Prince Abd al-Ilah – born 14 November 1913 – died 14 July 1958, married three times first to Melek el-Din Fauzi in 1936 divorced in 1940, then to Faiza al-Tarabulsi in 1948 divorced 1950 and finally to Hiyam 'Abdu'l-Ilah in 1958. Princess Badia – born June 1920, married Sharif Hussein bin Ali. They had a son, Sharif Ali bin al-Hussein. Princess Jalila – born 1923 – died 28 December 1955, married Sharif Dr. Ahmad Hazim.